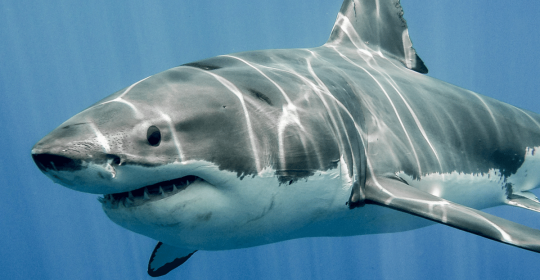 A shark extract could protect human nerve cells from dying and thus prevent certain diseases such as Parkinson’s. These are the findings of a research group at Cambridge University. In Parkinson disease nerve cells are dying because certain neuro-toxic substances are accumulating in these nerve cells. Since these cells play an important role in the coordination and execution of movements, people develop symptoms such as slowing of movements, tremor (shaking of hands) and muscle stiffness. The shark compound that can be found in the liver of dogfish sharks is called squalamine. The new study showed that squalamine could be able to protect these nerve cells from the neuro-toxins called α-synuclein. “To our surprise, we found evidence that squalamine not only slows down the formation of the toxins associated with Parkinson’s Disease, but also makes them less toxic altogether,” said Professor Christopher Dobson, of St John’s College at Cambridge University. “If further tests prove to be successful, it is possible that a drug treating at least some of the symptoms of Parkinson’s Disease could be developed from squalamine.